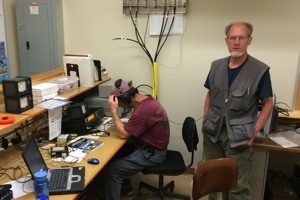 Should a major disaster strike midcoast or other parts of Maine rendering normal communications or degraded, there is a cadre of “amateur” radio operators that can respond and fill in gap until the communications crisis is over. The term “amateur” refers not to a lack of formal training and subpar performance, but to the fact that they provide their services free of charge to the public. In fact, in most cases these ham radio operators are highly trained, skilled, and professional. Waldo County is lucky to have such a team of dedicated volunteers. Working closely with the Wald o County Emergency Management Agency, this group trains and operates under two emergency communications programs. The Radio Amateur Civil Emergency Services (RACES) is administered by local, county, or state government. The Amateur Radio Emergency Service (ARES)® is affiliated with the American Radio Relay League and often serves government agencies, and such non-profit organizations as the American Red Cross, Salvation Army, and other groups associated with disaster relief efforts. Working jointly under Waldo County ARES/RACES, the hams regularly participate in drills, exercises, and training opportunities. In fact, they will be participating in the mass casualty exercise at Mount View High School in Thorndike on July 19, and also during the Isleboro Crossing for LifeFlight swimming event on August 23, where the plan is to station ham radio operators on boats. In Waldo County and around the state and nation, similar groups provide communications during parades, races, and other community events. These events further hone the radio operators’ skills and keeps them practiced in proper radio procedures. Most every major disaster, including the terrorist attacks of September 11, 2001, Hurricane Katrina, devastating tornadoes, the Boston Marathon bombing, and major earthquakes, has seen hams provide the backup disaster communications that FCC regulations tout as part of the licensing procedure. The normal communications infrastructure becomes overloaded or disabled during or after major events. These systems include the public safety communications and the cellular phone towers. 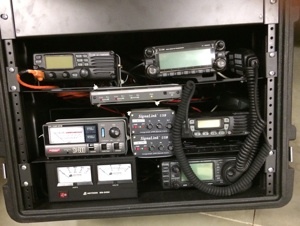 Hams have their own radio equipment, portable power systems, a wide range of available frequencies and modes, and can even fabricate antennas on site. pressive radio room as part of the Emergency Operations Center in the EMA building in Belfast. The county also acquired an older ambulance for the group, and converted and equipped the vehicle into a capable communications platform for responding to disaster scenes. Waldo County ARES/RACES holds a monthly meeting at the EMA building on the first Monday of the month. They conduct regular on-the-air radio nets, including an innovative training net using digital modes optimized for emergency communications, called Narrow Band Emergency Messaging Software (NBEMS). The vast majority of the time there is no major disaster. When not involved in their own personal and work lives, the Waldo County hams become the eyes and ears for the EMA office and EOC. They can relay voice, graphical, digital and other information from public events and exercises back to the EOC, so the EMA Director can analyze and predict what resources first responders may need. Any amateur radio operator interested in joining the Waldo County ARES/RACES may call the Waldo County EMA office (338-3870) and ask for Brit Rothrock, AB1KI. Hams in other Maine counties can contact their local ARES Emergency Coordinator, or call Phil Duggan, Maine Section Emergency Coordinator 546-1575.